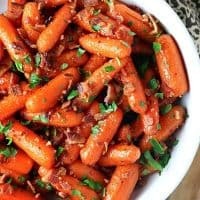 SWEET AND SPICY MAPLE BACON CARROTS — Baby carrots are roasted in a spicy maple glaze, then finished off with crispy, crumbled bacon and fresh parsley. When it comes to Thanksgiving side dishes–or any side dish, for that matter–I like to things to be simple but loaded with flavor. And these Sweet and Spicy Maple Bacon Carrots are exactly that! Now that my kids are a little older, they’ll tolerate a little more variety when it comes to cooked vegetables. 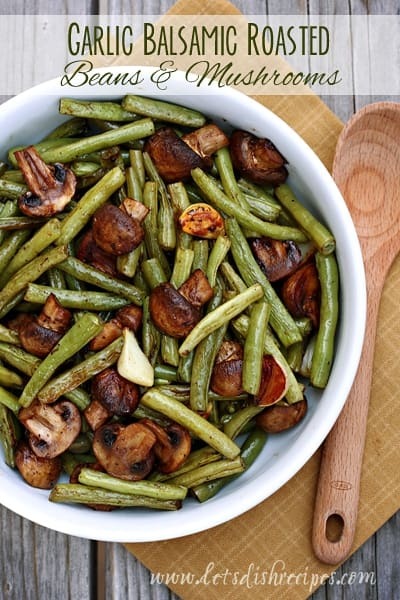 Carrots and green beans are their absolute favorites (unless you count french fries), so I’m always looking for exciting new ways to prepare them. 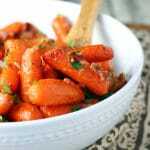 My boys all love spicy food, so I figured these sweet and spicy carrots would be a hit. I was not wrong! If you’re not a fan of spicy food, don’t worry. You can use as little, or as much, of cayenne pepper as you’d like. Since we all love spicy, I used a big pinch! With the maple syrup, it’s the perfect combination of sweet and spicy. Of course, the crispy bacon is the best part. It pairs perfectly with the maple glaze. 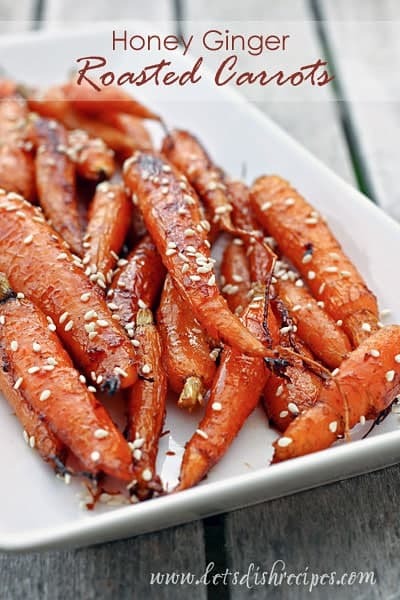 I always use baby carrots for this dish, but you could certainly use larger carrots and cut them into smaller pieces. Or leave them whole for a great presentation. Just be sure to adjust your cooking time accordingly. I also recommend getting the bacon cooked up ahead of time. Then you don’t have to worry about it when your scrambling to get dinner on the table. Which is especially important when you’re preparing a holiday meal! I love that these carrots are simple enough for a weeknight dinner, but special enough for company and holidays. They’ll definitely be making an appearance on our Thanksgiving table. 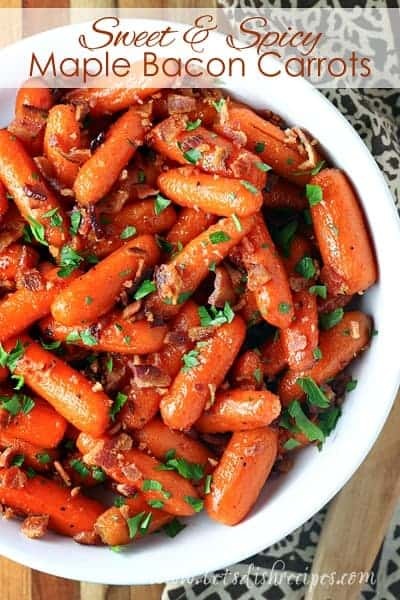 Be sure to save this recipe for Sweet and Spicy Maple Bacon Carrots to your favorite Pinterest board for later. 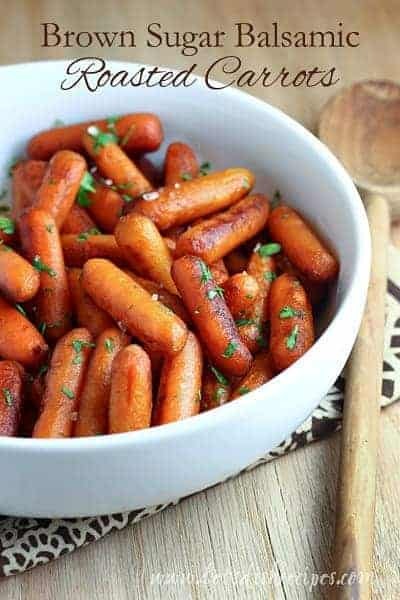 Baby carrots are roasted in a spicy maple glaze, then finished off with crispy, crumbled bacon and fresh parsley. Preheat oven to 425 degrees. Line a large baking sheet with foil and spray with non-stick cooking spray. Arrange carrots on baking sheet in a single layer. In a medium bowl, stir together maple syrup, brown sugar, olive oil, salt, pepper and cayenne. Drizzle syrup mixture over carrots and toss to coat evenly. Roast for 25-30 minutes, are until carrots reach desired tenderness. Stir once halfway through cooking time. Remove carrots from oven and sprinkle with cooked, crumbled bacon and fresh parsley. Serve immediately.